Every trade has its tools – even a job like stump removal can't be done without the right item in your toolbox. We say this in a strict figurative sense, of course – stump grinders are far too large and menacing to fit in any toolbox known to man. The most efficient stump grinders are also the most expensive ones, meaning you'd probably be forced to settle for a lower-grade model if you chose to handle the job on your own. These will often leave behind parts of the stump and especially the roots that customers will usually want to do away with. The stump grinders we use are top-of-the-line and will turn every last bit of the stump into fine dust, even grinding away the roots if you ask us to. But even if you could get behind the wheel of our commercial stump grinder, would you really want to? There aren't a lot of devices as dangerous as a stump grinder that isn't being handled properly, or one that's being manned by someone whose concentration has seen better days. It's not just the 'driver' that can get injured, even with all the safety equipment in the world – passersby can sustain serious injury just from being in the vicinity of the job. You'd be surprised by the speeds that flying debris from a ground-down stump can reach – even a piece that's half an inch in diameter can scar someone for life. The best way to eliminate these concerns is to have us do your stump removal from start to finish. While we would never start a stump removal job without ensuring everyone around is safe, we'll still grind them down in a way that will minimize flying debris – let's just say we prefer doing it that way, not to mention that it reduces the chances of property damage occurring. 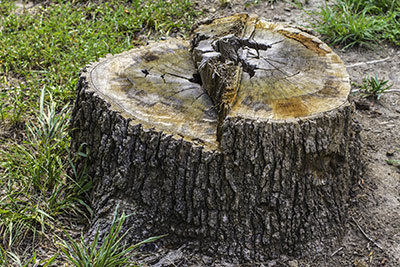 We can remove a stump from a freshly-cut tree or one that's been around for a long time. Likewise, we can also remove multiple stumps – even dozens of them – in a short amount of time in order to clear your land and prepare it for future work. 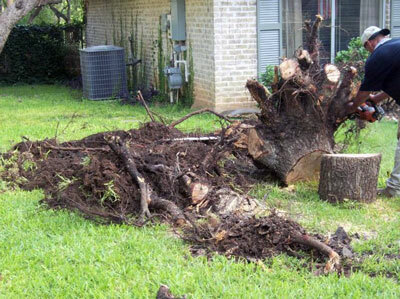 In fact, quickly ridding a person's property of what could be dozens of stumps is one of our specialties – you won't have to wait a day longer to start putting all that soil to good use. It's likely that you've seen stumps lying around in forests, parks and even people's yards. The reason people leave them behind has little to do with sentimentality (or the stumps' appearance, which only signals that a tree was cut down from its glorious heights) – more than likely, they had no way of removing the stump once they got the tree down. Don't let your property become reminiscent of a tree graveyard. Instead, have us take care of the stumps – the unpleasant memory of having had to cut one or more trees down long before their time will become a distant one.